Looking around TD Garden, one thing strikes you about the crowd that is assembled on this particular Saturday night. It’s not the normal crowd for an arena that’s home to both Boston’s professional hockey and basketball teams. Instead, the crowd is mostly female and extremely racially diverse. Their reason for being here is completely different: to see Michelle Obama’s new memoir Becoming, come to life. Along with her book release, Obama also announced a tour to go along with it, where fans can gather to hear her stories in her own words. Boston is the fourth stop on her tour that started in her hometown of Chicago. Boston holds a significant part in the Obama family storyline, where the discussion of Barack Obama running for president. Here in this exact spot, Barack gave his famous 2004 Democratic National Convention keynote speech which spiraled a discussion of Obama running for president. Michelle, grounded as ever, didn’t think anything of the speech. Even afterward when all the chatter started, she didn’t think anything of it and was skeptical about Barack running for the presidency. Everyone knows how that story turned out, but not everyone knows Michelle’s story. In her memoir, Michelle talks about growing up on the Southside of Chicago, Illinois in extremely tight quarters with her brother and parents. It follows her through her schooling, with her being stubborn at a very young age. In kindergarten, Michelle’s class had to read colors spelled out on index cards that their teacher held up. On the first try, Michelle got every word except for the last: white. Two of her classmates got all of them with their reward being a gold sticker. The next day, Michelle wanted to prove herself. 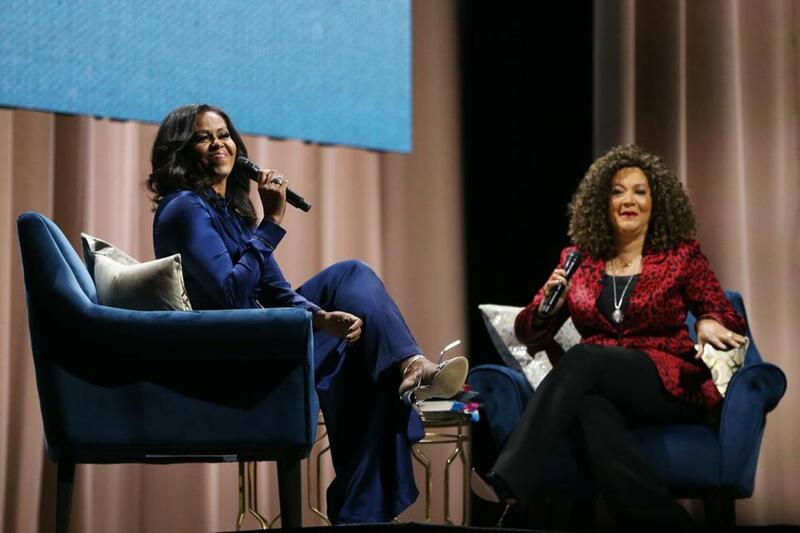 That spirit followed Michelle through her college years at Princeton and Harvard University and when she hit the workforce. That is until a man named Barack Obama came along and changed her perfectly laid out plans. “He was the king of swerve,” Obama said at TD Garden on Saturday. That swerve led him all over the country, eventually landing in Chicago while Michelle was working at the same law firm that they met at. The swerving led them all the way to the White House. One of the hardest days was when the Obamas were leaving the White House before Trump’s inauguration, for different reasons other than the obvious one. Michelle shared a story of how the night before, Sasha, their youngest daughter insisted on having one last sleepover with her friends in the White House. At the last minute, Michelle was trying to “push crying girls through the doors”. She was so frantic that she didn’t have the time to reflect on the last eight years in that house. It didn’t hit her until the helicopter ride over Trump’s inauguration crowd when she let herself go. “I had been crying for thirty minutes,” she said. When she saw the crown from the ariel view something else hit her though, this time about the crowd. This entry was posted in Lifestyle, Off Campus, Uncategorized. Bookmark the permalink.